TCA & NAS...not familiar. I checked my friend Google...Probably not Network Attached Storage, though trichloroacetic acid could be a hit. I guess from context that NAS means not age specific, or no age specified. I never heard TCA before. Anyone tried the Glenfiddich Fire & Cane? It's apparently their only wide-distribution peated expression (what I heard is that their other peated whiskies were only available in duty free shops). I got one a couple days ago, and it ain't bad. Pretty different for them. Wife brought me a bottle of Old Pulteney Noss Head on her way back from England. Not bad, clean and sharp pretty straight forward but drinkable. This Laphroig Triple Wood is really, really good you bastards! ^ Sounds like you're gettin' wood. Reports are that the Laphroaig Cairdeas 2019 is CASK STRENGTH TRIPLE WOOD! Thoughts? Anyone try that one? Last edited by Buddhabreath; 02-28-2019 at 12:39 PM. Can't say I've ever heard of Lidl or Queen Margot Scotch. Probably little wonder, as I live near none of their retail locations. Also, I wouldn't consider a blend to be world's best Scotch, unless it won a taste test with all single malts. Possible, as there are some good blends, but unlikely. I question the placement, after the article, of a video ad for an old fashioned, a drink containing no Scotch. I don't question that Queen Margot Scotch is good, but it is unlikely I will ever see it. It has to be true...It's on the Internet. Lidl is Aldi's closest competition on the hard discount food supermarket (yeah, it's not just about food, but it's their core business) in Continental western Europe, and Lidl about twice as good as Aldi in terms of quality/price - both are German firms, BTW, and have legally limited surface >> in other words they cannot open huge hypermarkets. Both are low-end quality food chainstores, but in recent years, Lidl has done improvements. Yet, I still wouldn't even try the Margot blended scotch. Yes, my reaction was one of incredulity that an 8-year old blended scotch could garner such a rating of course. But it it's cheap and good, what the hell. I scanned the story the other day too. Did they say it was the best blended Scotch or simply, best Scotch? According to another source it won best blended scotch 12 years and under. Ah now it makes sense - fake whisky news. Being in the American West, I had not heard of Aidl or Lidl before. The nearest city has a few large liquor supermarkets. Some of them seem to have their own brands of liquor, in addition to the world brands they can stock. I guess there are brands that don't distribute out here. If their sales depend on fake whisky news, I won't miss them. To change the subject slightly, from Scotch to Irish, it's the time of year (St Patrick's Day) when Irish whiskey and stout are sold for lower prices for a week or a month. So I decided to try an Irish whiskey I had never had. 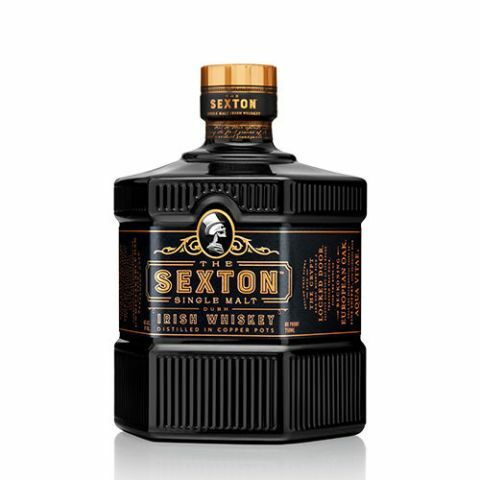 The Sexton Single Malt Irish Whiskey. Our daughter got married yesterday, and we met the groom's parents for the first time at the city hall where the ceremony was held. They are from Cambridge, England, but originally from Scotland. After the ceremony, at a restaurant for a celebration, we got chatting about whisky. They own a cask at an Islay distillery. It's 6.5 years old now and they visit it once a year and taste how it's coming along. At the 10 year mark, they get to choose from a number of packages, such as paying all the costs and taxes and getting all the bottles (well over 200) with labels or getting some bottles and selling the whisky back to the distiller, etc. All sounds pretty cool. When they go to the distillery, they get to take pictures with their cask (about 200 liters in size), but they have to make an appointment because it's a real job getting the cask down from where it's stored. They brought us some samples from the Islay distilleries. One I'd never heard of, Kilchoman, was very nice. I think I'm going to like these folks. I did a bottle this weekend and it was excellent. I have a quarter left, it was so good I can't believe I drank that much of it. I've really been enjoying The Macallan Triple Wood 12 YO. In a powder blue box. I think ther's a variation that comes in a navy blue box. Hey, congrats! Glad to hear that the in-laws seem to be nice folks too.